The Barrett/John Award, named for Bro. Jonathan Barrett Ξ’97 and Sis. Betsy John Ξ’99, is given by the St. Anthony Association of North Carolina to an active member presenting a revised piece of work (be it written or visual in nature). In return for their hard work, SAANC provides the recipient with a paid registration to the GC. We are pleased to present this year’s selection for your reading pleasure. Leading into the star-swamped back-woods is winding asphalt which carries me between the salty bubble of Wilmington and the open marsh of my home. On the road only the oldies and stoners go under 60. The road begins at the end of green metal grates that carry you, bouncing, two hundred feet above the saucy, brackish Cape Fear. She sustains this place, despite claiming in her youth countless travelers by means of coy shoals and privateers. The bridge makes some people nervous. I feel secure surrounded by steel. Deer frighten me more. They lie in wait about ten miles down 133, hiding in the beeches and firs yet to be replaced by palm cousins stuck in front of houses. When I reach the neon “deer crossing” sign I plead silently for the does and especially their young to stay put so I can make it to the drive of the little yellow house in the cul-de-sac. So far, they’ve made no challenge. There are stars out here like you can’t find back in the bubble, where the community college and car lots hide the blinking specks with an orange glow. Once I’m home I get out of the car and look for Cassiopeia, “the lady in the chair.” Finding her, I walk to the front door, painted whatever color has struck my mother as up-and-coming lately. She always knows what the new color will be. Emerald green, lavender, black. Before entering I greet the fat-bellied tree frogs that serve as my doormen until November. Sometimes longer. Saying goodnight I thank them for their care and consistency. This little yellow house is located in Winnabow by postal definition. If asked, we live in Leland. Despite misconceptions of its distance from “town,” its existence is generally known. No one knows where Winnabow is. An “unincorporated community” of Brunswick County, it’s a part of what the locals have deemed “L.A.” The Leland Area. L.A. is Leland proper, Belville, and Navassa. Belville is where I attended fourth grade in a trailer. The elementary school is one of the three landmarks named on the town website, and two parks. 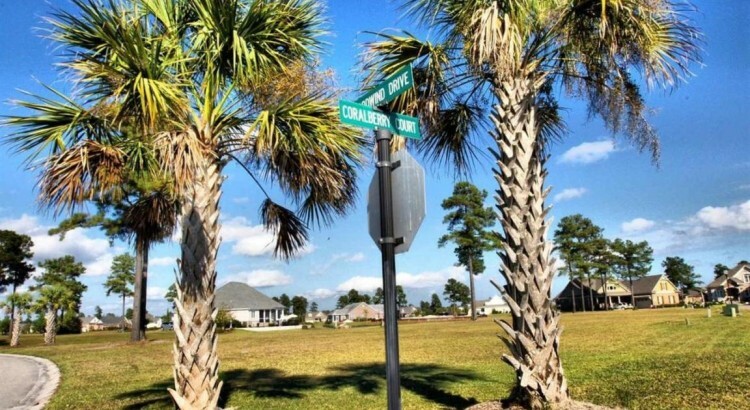 The first is the town park across the street from the school, once a part of the Belville Plantation owned by a former governor of North Carolina, the second the 200-acre Lincoln Industrial Park on Highway 17. Navassa is where my brother-in-law had a shotgun aimed at him for trying to survey the edge of a man’s lawn in order to lay a water line. The first three results you get when entering “navassa” in a search engine are “fire department,” “meat packing plant,” and “shooting.” The town was named after a fertilizer plant. Leland proper was recognized in 1897 with a petition for a post office. One of the petitioners chose the name Leland after his nephew. When I was 18 I met Josh the tattoo artist, who grew up in Leland, and is the great-great-great-etc.-nephew of the namesake. In 1987 Josh lived in Maco about 20 minutes out. Josh was already different because he was born in Settle, but he was also brown, his father Indian-Fijian-Nepalese. He was homeschooled and would roam the surrounding acres. Once, while crossing a small bridge, Josh heard men’s voices. Hiding in the grass, he watched as white hoods passed by. Yet it’s another time, when walking along the same bridge he found a trash bag with a skinned deer inside, which he calls his first experience with death. Once, while crossing a small bridge, Josh heard men’s voices. Hiding in the grass, he watched as white hoods passed by. It’s 2016 and three years ago the Walmart Supercenter opened about five miles from the exit to Wilmington. New neighborhoods have sprung up faster than crab grass, fostering the growth of businesses catering to those who cross the bridge seeking quieter living. The amenities are here. A yoga studio. A 24-hour gym. An Italian restaurant. Florist. Wine shop. Frozen yogurt bar. Midwesterners and Yankees make up a proportion of the newcomers, looking for the beach living of Wilmington without the price. We’re next to the marshes and 30 minutes from the beaches, but palm trees are integral in all landscaping arrangements, shunning the native firs. Palm trees bring the beach to the buyer. Like palm trees, plantations are prevalent. Brunswick Plantation. Waterberry Plantation. Magnolia Greens Plantation. On the Carolina Plantations Real Estate website there’s a link to “Find Your Plantation.” The plantations are filled with homes made with pastel boards, or brick if they’re large. The homes of my development, Mallory Creek Plantation, are uniform in their neutral and pastel lap vinyl siding. The green yards remain cut, and azaleas bloom from the mulch or pine straw. In none of the plantations will you find homes like those outside, the brick ranch-styles tucked behind oaks, or double-wides with porches built on. My Leland includes a grocery store, a handful of fast food joints, a gas station, a Waffle House, and one favorite back road. Food Lion’s parking lot is a prime spot for sneaking a cigarette. McDonalds and Bojangles are go-tos when babysitting my sister’s children. The employees of the old green and yellow Scotchman call me “baby.” At 3 am Waffle House provides reliably greasy meals and control of the jukebox after a 12 hour shift waiting tables. Some of the waitresses are my age, but they have kids. I leave ten dollars every time and hope it doesn’t seem condescending. This is what I’ve shaped into my Leland. There was a time I was angry, sequestered in a sickly green, yellow, and gray of highway shrubs and nothingness. But over time isolation can turn to sanctuary whether you mean for it to or not. That’s how I found Blackwell. Blackwell Road fell out of regular use once 133 fast-tracked the way from Walmart to the bridge. Now it can only be reached if you’re leaving Leland. Veering right from 133 the vein of Blackwell appears quietly, no sign naming it, so that you’d only take it if you knew where you going. The only light near the entrance is from an old gas station off the side of the highway. The untouched green on its sides shrouds it in darkness at night. The yellow lines between the lanes are faded. Blackwell feeds off metal. Halfway down the stretch is the recyclery, accompanied a ways down by Lewis Auto Parts, Irving’s Used Auto Parts, and an honest junk yard. Only a few yards down is a daycare. There are homes as well along Blackwell. They testify their longstanding presence with faded shades of cornflower blue and stained cream slats. Trees drop Spanish moss that hovers over the patios. I never see anyone on them. I imagine who lives in these small mossy homes. Most of the lawns are neat. None have children’s toys scattered about the yards like in my neighborhood, though long field grass frequents any and all areas left without constant maintenance. But my favorite spot on Blackwell is halfway along, where for a while there was only an empty plot of grass. It’s a perfect square, cut from the trees, and so perfectly flat it looks as if it has been groomed for a pagan ritual. Six months before it was an empty plot a church had stood, the roof burnt off. The Blackwell Chapel African Methodist Episcopal Church was built in 1849 and caught fire around four am on a Friday morning in 2010. The chapel fire was the fourth in the area that week. The first was four days before. An abandoned home burnt down in the woods adjacent to the church. The house had no electricity. The second, an occupied home nearby due to electrical issues. The third, two hours before on the same morning as the chapel, fire broke out in a nearby mobile home. Though calling the rash “unusual,” Leland police uncovered no connections between them. The cause was never determined. The Blackwell Chapel had recently celebrated 160 years, and with no structural issues. Missing as well was a pickle jar of change, money raised for things needed. When interviewed, one of the congregation members said she believed in miracles, but not coincidences. I feel similarly. When interviewed, one of the congregation members said she believed in miracles, but not coincidences. I feel similarly. What will be built atop the selling ground I do not know yet. I don’t think anyone does, though there was rumor of a Starbucks. For now the orange plastic remains around it, the color infecting the whole exit in the shape of cones and flags. Because of the reshaping exit, Blackwell cannot feed to the Walmart anymore. Only away. And this works well for me. I’m glad to have it to leave by. When I leave the plantations and shopping centers, and head back towards to my painted door, my cul-de-sac and my tree frogs, and before that pass the red of my Bojangles and sanctified yellow of my Waffle House, I never miss the chance to see the flat plot. The metal, the moss, the stained slats. L.A. is rerouting itself and the end of the road has curved, but Blackwell stands. While it does, I will take it. Author’s Note: As the Barrett/John Award suggests, this is a piece in revision. I hope to continue revising it into a larger body of geographical, social, and personally explorative work. Thank you for the honor of the Barrett/John Award, and for reading.